A year ago, the equatorial Pacific was pulsing with heat, due to one of the most intense El Niños on record. But the current La Niña has been relatively quiet. 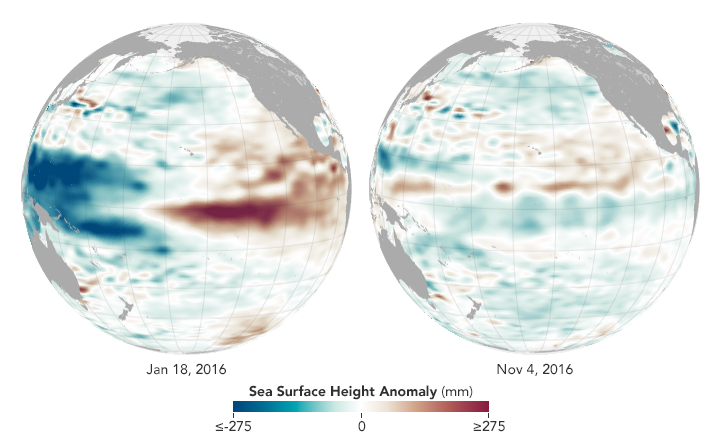 The 2015-2016 El Nino was one of the most intense on record. But the current La Niña, the cool sister pattern to El Niño, has been relatively quiet. In a report issued in December 2016, the NOAA Climate Prediction Center described the latest La Niña as “weak” and likely changing to neutral conditions in early 2017. El Niño and La Niña are periodic weather patterns resulting from interactions between the ocean and the atmosphere in the tropical Pacific Ocean. 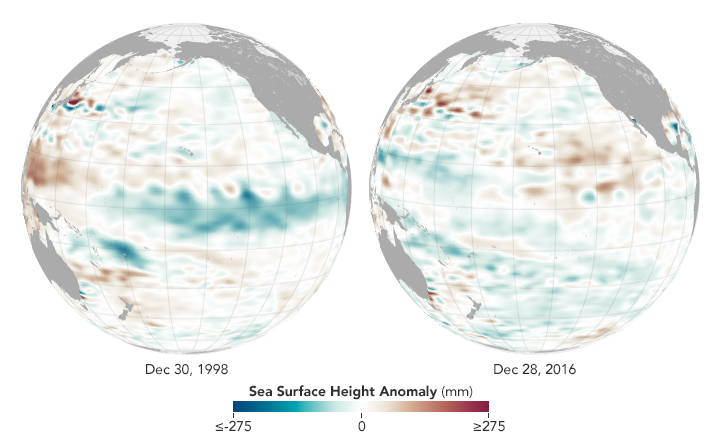 While El Niño knocks down trade winds and pushes warm water from the western Pacific to the Americas, La Niña pulls up cool water from the depths of the eastern Pacific, and pushes the warm water back toward Asia. That’s why regions that get drenched with rain and snow during El Niño often go dry during La Niña events, and vice versa, as atmospheric circulation and jet streams shift with the changing heat and moisture supply from the vast Pacific Ocean. The video below explains how El Niño and La Niña work. Last year’s Niño was huge in area, duration, and magnitude. My take is that because it lasted so long and covered such a large area, it damped the return of strong trade winds needed for a healthy Niña. Though there are common features that characterize all El Niños and La Niñas, each one is different with its own unique personality. That a strong La Niña followed a strong El Niño in 1997-98 does not mean that all strong El Niños are followed by strong La Niñas. Just when you think you have seen everything and think you know what to expect, something happens that you just can’t explain. There are many rhythms and natural variabilities, and nature will always keep it interesting. Bottom line: Although the 2015-2016 El Nino was one of the most intense on record, the current La Niña has been relatively quiet.